"Stop just assuming you have a full lifetime to do whatever it is you dream of doing." Scott Riddle’s life was suddenly upended after being being diagnosed with metastatic cancer. The 35-year-old Google employee is coming to terms with the fact that he may never see his three children grow up. He’s now urging people not to take their lives for granted, or to assume they still have decades ahead of them. A few days ago, Scott Riddle sat down at his computer and began to write. Just three weeks before, the 35-year-old Google employee had received life-changing news. 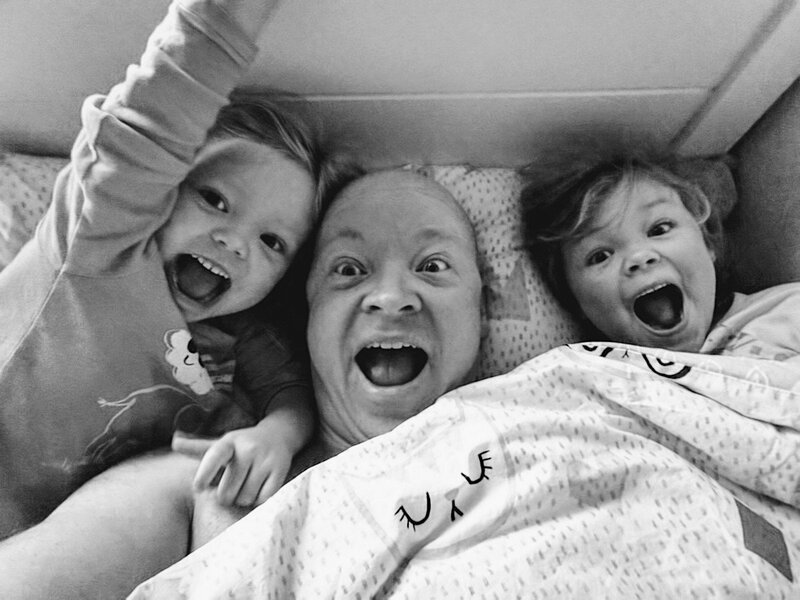 He had been diagnosed with Stage 4 colon cancer, and was coming to terms with the fact that he may well never see his three children, aged five, three, and a few months old, grow up. “I don’t even know why I did that Medium post, I had that urge to just sit down and just write about it,” Riddle told Business Insider in an interview over Skype from his family’s home in Australia. The hastily written post detailed the discovery of his disease, his cloudy prognosis, and life lessons it had brought sharply into focus. He expected just a few people to see it — but more than 70,000 people have already read the post, and he has been shocked by an outpouring of support from strangers around the world. He had a new job lined up with Google, after working in strategy and operations for six and a half years in the US, while his wife had found a job with a logistics startup. Google’s offices in Sydney, Australia. The following Monday, he went for the colonoscopy, where a doctor identified what appeared to be a cancerous lesion. It was subsequently confirmed as Stage 4 metastatic colon cancer — indicating it had spread to elsewhere in his body. And just like that, his life changed forever. Riddle is currently on a treatment of chemotherapy and radiation, with plans for surgery, and currently doesn’t even feel ill — just a little tired, he said. But his condition in the months ahead may change. “Stage 4 however is not too good at all. Doctors use ‘survival curves’ — survival statistics for people with your cancer and your stage of progression — to provide some kind of prognosis. In my case, most published survival curves suggest that only 10% of people are still alive 5 years post diagnosis,” he wrote in his blog post. He trailed off, temporarily lost for words. It’s this message that Riddle felt compelled to share, and sits at the heart of his blog post: You can’t take for granted that you’ve got your full life ahead of you. “One of the things I’m struggling most with is this concept of legacy. I’m a planner. Before this diagnosis I’d been thinking of my 1st 35 years — aside from being a ton of fun and travel — as preparation. I felt like I was building a platform (savings, networks, skills, experience) that I could then use in my second act to make a real contribution, to ‘make my mark’, to build a real legacy for my kids. Perhaps that was a mistake on my part, because I may have no time to do that now. I guess I’m panicking a little. One of the main reasons the Riddle family moved back to Australia was that they planned to buy land and set up their own farm. A question mark now sits over that plan, as Scott Riddle wrestles with the best cause of action. Should he create the farm, so it can act as a legacy for his family if he doesn’t make it — or would it risk unnecessarily burdening them? The father-of-three also hoped to start his own business one day, but now has no idea if he’ll be able to. He described a strange duality to his life: Carrying on, expecting to live — while also preparing for if the worst should happen. He has taken time off work (“Google’s been awesome,” he said, praising the company’s benefits package) as he sorts out his priorities and works out next steps. “As I understand it, when you have metastatic cancer, even if I get to the end and they say ‘okay you’re all clear,’ you’re kind of never really clear if you’ve had metastatic cancer … lets say I get to the other end in January, I pop out the other side of two surgeries and chemo and radiation and they say all clear,” then he still needs to come back for frequent check-ups for the rest of his life. The 35-year-old said he wrote the blog post in about 15 minutes, barely even proof-reading it before he posted it online — only going back to edit it later. But it clearly resonated, with tens of thousands of people reading it and commenting on Medium, Facebook, LinkedIn, and across the web. The Australian never expected this outpouring of support, but hopes people will take it as a lesson. “In your day-to-day [life] it’s a fact that you end up not focusing on the things that are most important, and every now and then a little reminder that things can turn out in very unexpected ways, it’s good. Most of the people who saw that Medium post and added a comment and were affected by it on that day … they’ve probably forgotten about it by the end of the week,” he said.